Meh. Was bored and whipped this up real quick. 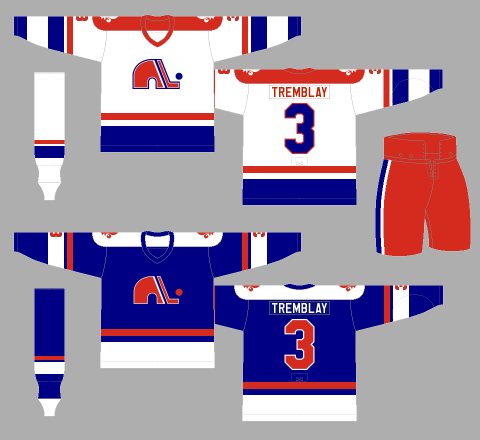 Based on their early WHA uniforms. C&C welcome as always. I like it. The jerseys look excellent with the little bits of red. I like it as well but I don't think a red fleur de lys would fly in Quebec. I agree the fleur de lys doesn't look right in red, yet they did use it on their early WHA uniforms. This is similar to what they wore in the early days (when Joe Sakic was starting school), and would have been a plausible variation. See the WHA Uniform Database (1974-75). Looks like a solid, albeit lateral move from their last set. That being said, I actually like the "Fleur De Lys" in red... gives the classic mark a renewed sense of purpose.